I never thought I'd say it, but I'm kind of getting into brass. Metallic anything is in style right now, and in my cave of a house with dark woodwork, a little sheen is nice. Yesterday I amused myself poking around eBay and Etsy for brass doorstops, paperweights, and other sculptures. 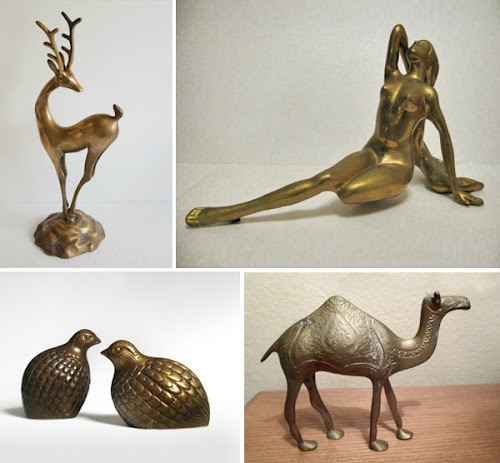 I'm not sure who decided that tigers, camels, deer, and elephants are the best animals to cast in brass, but there are herds of them running around resale sites. Here's the tip of the iceberg when it comes to vintage brass figurines, available at Etsy and eBay. Above: Giraffe, dancer, parrot and deer. Above: Deer, woman with long hair, quail, and camel. I also liked this goat but forgot to add him to the photo collage. 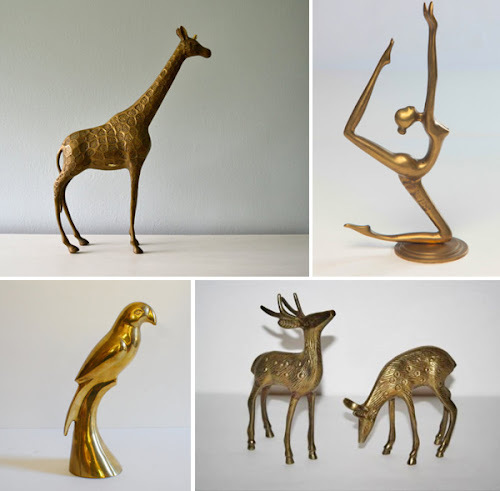 Consider a brass Christmas gift for the mid-century animal lover in your life! How many did you buy??? 42! Just kidding. One. A lady. I'll show you when she arrives. I liked the lady with the long hair very much but Alex vetoed the idea of an unclothed person sitting in our house. And she would not look as graceful if I sewed a little outfit for her. Funny... I just came back here to say I hope she was clothed... ha! Yay, Alex!! I recently found myself wishing I'd grabbed some of my grandmother's brass crazy before she died. Followed by wondering what strange brass loving alien had taken over my body. I am having that alien feeling myself. My mom has a brass frog prince in her entryway and she LOVES him. Brass figurines for everyone! I just got a quail today! How about Paha Ska's End of Trail in brass? That would be cool! Anonymous, are you my dad? Cuz that's exactly what he would say. I'm not a huge brass lover but I love that camel! your dad was dying to make a comment so his helpful assistant/advisor did his best to make it happen. Mr. advisor chooses to remain anonymous. You might want to try Everything But the House for Vintage goods. It's an online estate auction. Those are great finds! We have a pair of ducks and a Spanish bull (complete with sword running it through!!!) from my husband's grandpa who collected brass figurines... not my first choice of animals, but the ducks at least still get pride of place. Nicole, nope. I bought a sort of delicate statue instead for the mantel. Kayla, THANK YOU!! That's too funny! My parents had the giraffe and the quail. Recently some things appeared in our front yard after possibly falling off the trash truck or a moving truck. Among the broken items was a lovely undamaged brass crane bookend. I probably would never have purchased a brass bookend but am glad it landed at our house. It looks great sitting on our family room bookshelf. By the way, I love your blog posts and wonderful design skills! Happy Holidays! Thank you! And wow, I wish something cool would fall off a truck in my yard. i hope you bought the quail. they are SOLD and so cute! I started collecting brass animals after cleaning out my 81 year old mother's house. Let's keep their charm our little secret so the prices don't go sky high! Maybe it's just me, but I find a lot of brass horses. I started collecting them a few years back and honestly, they look rather majestic all together in a herd on my bookcase. Have you purchased any and started collecting them yet? I only own one dala horse made from brass. I bought ist for about 1 Euro at a thrift market. I like it's look, but I don't like it's smell. Does it smell like a horse?